My first year in "adulthood" has opened my eyes to just how thoroughly cultural Christmas is for us Americans. The lights, the music, the sweaters and scarves, the eggnog, parties, beautiful window displays, and endless decorations are all so deeply ingrained in our sense of identity that the month of December just wouldn't feel quite right without it all. A few of my friends were actually on a flight back from Somalia when they landed in an airport completely transformed by all things Christmas- and they started crying. The deep sense of comfort they felt at the first sign of "home" was overwhelming after being somewhere so foreign. Then I realized how much of the "Christmas season" has become about just that- comfort. We just love to feel good about ourselves. Safe, warm, loved, and secure (I mean, I don't know about you but that's how I feel when I drink Starbucks Christmas blend!) There's sort of this "end of the movie" emphasis on Christmas- everything works out ok, Santa is real after all, and all we need is the "spirit of Christmas" to put a glossy finish over the pain in our lives- so our brokenness doesn't have to feel as broken. But lately I've been realizing that when we dig through the comfortable, cultural "glossiness" of Christmas, we find that it's not a Hallmark card type sentiment at the bottom of things; instead, it's the very thing we try to drown in cookies and milk- our brokenness. Let me explain. A few weeks ago Michael's grandparents (and Texas natives!) had a really unique plant on their table. A hard, thorny plant with a tiny pink blossom emerging, I was immediately struck by it. They explained that it's called Christmas cactus because it only blooms this time of year. I thought, "what a perfect picture of Christmas." A hard, thorny world blooms with the inception of its only hope- God in human form. The good news of Christ is set in stark contrast to the bad news of our humanity. It's in this context of realizing our own pain, our own broken lives, that we can see and understand the weight of Christ's coming- it's the news of a hope that responds to our need, not that denies its existence! Remember the words from O Holy Night? "a thrill of hope, the weary world rejoices" and "long lay the world, in sin and error pining....till HE appeared!" The spirit of Christmas is not that nothing is really wrong...it's that everything is wrong but there is hope! There is an answer, and His name is Jesus. "And His name shall be called Emmanuel- God with us." The other thing the Christmas cactus reminded me of is myself. Because of Emmanuel, my own thorny heart has been made soft and the flower of Love has begun to grow. Along with the "weary world," my heart has recognized the coming of its King- and it has rejoiced! till He appeared, and the soul felt His worth. till yonder breaks a new and glorious morn! Fall on your knees- o hear the angels' voices. O night divine, O night when Christ was born. Leslie backpedaled in disbelief. She never thought she would hear those words. As a young girl growing up she imagined a white wedding dress, a happy couple, a home full of children. Her fantasies had not left room for the devastating chill these words carried spoken by a man to whom she'd entrusted her life, her body, her deepest secrets and intimacies. And now he was telling her that he couldn't stand to be around her anymore. The first cracks in their marriage had appeared about six years into their marriage when Tim confessed to a one-night stand. He told Leslie he was deeply sorry and was willing to seek counseling. After a lot of tears, they were able to put the affair behind them. Leslie had to work through some issues of trust, but the good times returned. A few years later, Tim left for a three week business trip. He was scheduled to return on a Saturday afternoon. Leslie was anxious for him to be home on time. Tim didn't return home on Saturday as expected. Leslie put the dinner dishes away and went to bed, expecting Tim to join her later that night. She woke up wondering if Tim would be lying beside her- but but he still hadn't made it home. She went to church that Sunday morning, convinced that she would see Tim's car in the garage when she got back, but the garage was empty. Her heart was beginning to sink, and then, later that evening, Leslie heard a noise coming from the garage. She opened the door and saw Tim putting his golf clubs in the trunk of the car. "What's going on, Tim?" she asked. He had been gone for three weeks. Surely he wasn't preparing to go play golf in the morning. And then the words came- those four soul-numbing words that blasted Leslie's world apart: "Leslie, I'm leaving you." She almost collapsed on the spot. "I don't love you anymore. I haven't loved you for a long time." Leslie felt the hysteria taking over again, and she began to panic emotionally. Then she looked at Tim's hand and felt her heart stop. Tim wasn't wearing his wedding ring. "You're not wearing your ring. Does that mean you're going to start dating?" "Yes." Slam! His immediate, calm, almost casual reply took her breath away. "Do you know who?" The fear started rising. Did she really want to hear this? "Yes, but I'm not leaving you for anyone in particular. You and I just aren't right for each other. I've been living a lie all these years, and I'm tired of it." Leslie began to feel herself losing control. The tears took over and she lost her composure. She held on until Tim drove away, then she became hysterical. The sos that came up from within her were deep and pervasive. Finally, she knelt down in a chair to pray, but there was still too much agony inside her. Day after day she waited, hoping things would change. Tim would come back. Months went by, and then years- and then finally the day that Tim told Leslie he was marrying someone else. Sometimes depression would creep up on Leslie, bringing a new dose of fear with it, especially as Tim's wedding day drew near. But then- there's no other way for her to describe it- the Lord would take her face in his hands and say, "Leslie, look at Me. Look at me." She wept and wept, but began to feel a new kinship with the Lord. Somehow she was sharing in His sufferings. They were gong through this together. She still wore her wedding ring, and while some people felt she should just "let go," the ring was a sign of the covenant Leslie had made not just with Tim, but with God. Even though Tim had walked out of the relationship, The Lord was still there- so two out of the three parties were hanging in there. "The wedding ring represents my commitment before the Lord- the One before whom I said, 'till death do us part." Right up until the day Tim remarried, Leslie wore her ring and kept praying for a reconciliation. By remaining faithful in the midst of unfaithfulness, her eyes were opened to God's presence in a new way. "The faithlessness of Israel and the faithfulness of God really spoke to me. This entire experience has helped me to get to know God better. I've gained a sense of the incredible unconditional love that His covenant represents. The more I sought God's permission to take off my ring and start dating, the more He would talk to me about His covenant promise." Two years after Tim left Leslie, Leslie's father called her on the phone. "I've watched what you've gone through. I've seen how you've reacted and I want what you have." This was a profoundly moving conversation for Leslie, for, like Tim, her father had been unfaithful to his wife (Leslie's mother), leaving Leslie to grow up with the pain of a broken home. But all the anguish began to melt away as Leslie walked through some Scriptures with her father in a hotel room, and her father knelt down and prayed to receive Jesus Christ as his Lord and Savior at the age of 62. There is an exalted truth in this conversation experience. What really happened was that by remaining faithful to an unfaithful husband, Leslie demonstrated the truth of a God who remains faithful to an unfaithful people. Her father had heard the gospel many times, but it wasn't until he saw it displayed in Leslie's life that he wanted it for himself. I've been thinking a lot about marriage lately (gee, what a shock!) In my life, the prospect of marriage has certainly brought feelings of both excitement and fear. Why? Why does it have so much power, so much weight, so much mystery even for us who seemingly get to make all our own choices about marriage? Nobody forces us into it, we're allowed to make our own time frame for the most part, we can choose our spouse, etc. etc. Society even "allows" a divorce if things don't work out! But we still treat it like a big deal whether we like to admit that or not....and everybody cries when the bride walks down the aisle! Why is marriage such a big deal? Look at that face of anticipation! 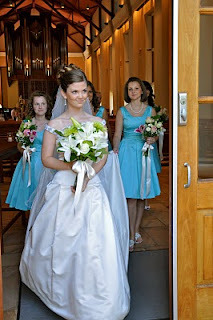 But seriously, my pastor told me that my bouquet was shaking when I got to the altar! Even though I was so sure about the one I was walking to, I was definitely nervous. Why? But I don't think God just realized Adam was a little lonely and decided to make woman so he'd have someone to hang out with, scratch his back, and watch movies with on Friday nights. I think maybe it "wasn't good for man to be alone" because man can't truly understand the love of God without getting to practice it and experience it in the context of another. In Ephesians, Paul says "husbands, love your wives as Christ loved the church and gave Himself up for her, that he might make her holy...that He might present the church to himself in splendor, without spot or wrinkle or any such thing...husbands should love their wives as their own bodies...this mystery is profound, and I am saying that it refers to Christ and the church." Ok, so...what? When Michael said "I do" what he was saying is "I am giving all of myself to you. I pledge to be faithful to you no matter what. If you get sick, if you are unfaithful to me, if you go absolutely crazy and start seeing monkeys everywhere (but seriously :) if you "fall out of love" with me and stop giving back the way I hope you will, it doesn't matter. I'm not going anywhere. I will always come for you." This is why, even if we're OK with divorce theoretically, nobody wants it. Because we are made to long for a love that is unconditional- and that's because there IS a love that is unconditional! And that is the message of Christ to His church- to the people He pledged to love. To an unfaithful, unloving, crazy, bride who does not love Him back the way He loves her...He has promised to be true. To give of Himself, to remain loving, to be faithful, to make us holy and "present us in splendor, without spot or wrinkle or any such thing, that we might be holy and without blemish." That is why I cry when I see a bride walk down the aisle, clothed in white, face beaming- because it reminds me of Christ and the fact that He has done the same for all who say yes to Him. He has pledged Himself to us forever, and even more! Remember my post about Jesus wanting the rose? He wanted us when we were dirty, trampled on, and stained- and He has washed us whiter than snow- clothed us in His righteousness so that we too can be presented to Him as blameless and pure...He turned us from harlot to bride. All by His power, because of His goodness, and in His love.